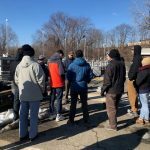 The NJ and PA-AWWA YP committees and the NJ and PA WEA YP committees collaboratively hosted the Scranton WWTP Tour and Ski Trip which was an all-day event in Scranton, PA on January 25th, 2019. 14 water industry professionals attended. 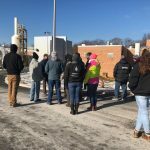 The group met at the Scranton WWTP and toured the plant. 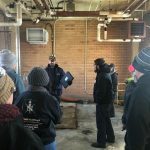 The tour began at the Scranton WWTP Headworks Building, went on to the primary tanks, final tanks, chlorination tank, and sludge handling building. Along the way, tour guide Daniel Rickard spoke at each process and answered questions from attendees. Midway through the tour, the group gathered inside the Administration Building for a Q&A session with Mr. Rickard. After the tour, attendees drove to a nearby Panera Bread Co. restaurant and enjoyed lunch together. Following lunch, YPs headed up to Montage Mountain and hit the slopes. After an afternoon of skiing and snowboarding, YPs were invited to spend the remainder of the evening at the Slocum Hollow Restaurant in the Montage Mountain Ski Lodge. Staff from Pennsylvania American Water volunteered their time to guide the tour.